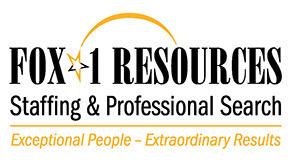 At FOX-1 RESOURCES, we strive to match talent with career opportunities that unlocks our candidate's potential. We believe that effective placement is never an accident. It occurs when the Candidate and the Company meet each other's needs. At FOX-1 RESOURCES, we take pride in our reputation for completing precision placements, delighting our clients and the candidates that we represent. "They provide better candidates in less time than their competition." FOX-1 RESOURCES will work to fill your position with top-quality candidates, according to your timeline. Our goal is to make sure our clients are satisfied. The full fee will not be invoiced unless we fill your position. Do you need to conduct your search quietly? We know how! Our team is experts in recruitment for professional, management and senior-level positions. We have experience in placing candidates in Finance & Accounting, Marketing, Engineering, Technology, Human Resources, Sales, Operations, Manufacturing, and Drafting & Design - Across all Industries! For a list of our staffing specialties please click here.